If you have a chronic medical condition, the flu is especially dangerous for you — so it is important to know when to call the doctor. The flu is, for most people who catch it, a real nuisance — but not much more, as they'll recover in a week or two, without antiviral drugs or needing to go to hospital. Influenza also has a darker side, however; it can be severe and even life-threatening. The CDC reports that about 900,000 people in the US had been hospitalized with the flu, while some 80,000 people passed away for flu-related reasons in the past year alone. People who have chronic medical conditions are especially at risk of suffering complications related to the flu. These include heart inflammation (myocarditis), brain inflammation (encephalitis), pneumonia. If you're one of these people, it's essential to be aware of the symptoms of the flu, what to do if you catch one, and how to lower your odds of ending up with influenza. 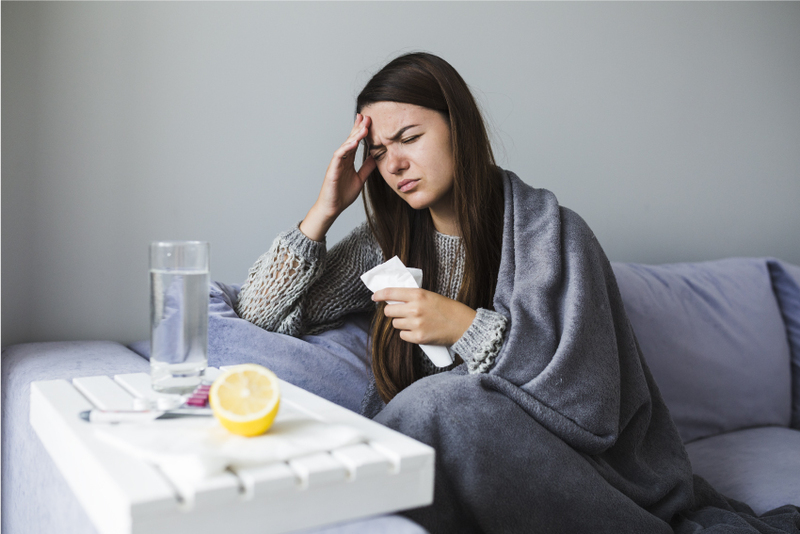 Which medical conditions can put you at risk of serious complications from influenza? Asthma — asthma patients aren't more likely to catch a flu than anyone else, but they do have a higher risk of suffering complications. People who have asthma usually experience more severe symptoms when they have influenza, and they also have a greater risk of developing pneumonia. People who are immunocompromised, including people who are taking steroids, receiving cancer treatment, or people who have HIV. Chronic health conditions don’t only increase your odds of catching the flu, they also make you more vulnerable to common colds. The symptoms are likely to stick around for longer, and be more serious than they would be in a healthy person. The flu is much more serious than a cold, though — severe complications are much more likely, so you need to be able to tell the two apart. The symptoms of a common cold can include sneezing, a sore throat, a cough, and a blocked nose, all of which tend to develop more gradually. Getting a headache or a fever from the cold is pretty rare. Though some people who catch a cold feel really weak or tired, this doesn't always happen. If you look at this list, flu symptoms are quite similar to the symptoms of a common cold. There are some differences though — these are feeling fatigued, experiencing aches all over your body, and a fever. The symptoms also tend to come on very quickly instead of appearing gradually. If you have a chronic condition and think you have a common cold or the flu should you seek medical help? Yes — and we’d add that it’s important to discuss this with your doctor in advance. Ask what you should be on the lookout for, and when you should see your doctor rather than trying to treat yourself at home with over the counter medications or rest. In the case of the flu, you should really see your doctor at the start of the flu season (October) and arm your body with the one thing that is most likely to prevent both the flu and any complications if you do get it anyway — your annual flu shot, of course. The CDC recommends that anyone older than six months get a flu shot each flu season. It’s even more crucial to get one if you have a chronic medical condition or you belong to another at-risk group. High-dose flu shots are even available for those who need extra protection. That's that then — your friendly-neighborhood reminder to get a flu shot. If you, as a person with a chronic medical condition, do still catch the flu after getting a flu shot, you should seek medical attention right away. That's because antiviral drugs, which reduce the severity of your symptoms and make the flu go away sooner, work best if you take them within 48 hours of the start of your symptoms — and you need a prescription to access them. Influenza: When should you go to the ER? You feel pressure or pain in your abdomen or chest. You have flu-like symptoms which get better but come back with a bad cough and a fever.